In a year where the RAF is rightly or wrongly grabbing the lion's share of the press, the Royal Navy was not without a look in as the regular early-July slot for what remains their only airshow once again rolled around. 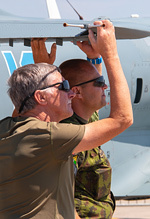 With promises of rare and exotic items in both the flying and static displays, together with the return of the Commando Assault finale, this year's Air Day looked once again to be a strong entry in the airshow calendar. Tom Jones reports from a sun-baked RNAS Yeovilton. Photography from the UKAR Staff Team as credited. In the RAF's one hundredth year, the Royal Navy, who celebrated their own centenary of aviation nearly a decade ago, have rightly taken a back seat from the press gangs and headlines in 2018. 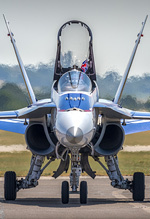 Still though, their flagship, and now only, annual airshow event once again allowed people the chance to get up close and see for themselves our nation's naval aviation. As our aircraft carrier continues to stretch its legs, the first F-35s to be based upon her arrive in the UK, the ex-RAF Merlins for the Commando Helicopter Force are well-into their full marinisation upgrade programme, and the last of the old guard Lynx and Sea Kings have, or are about to be, retired, naval aviation is steering a very clear course into its future. This airshow often manages to grab its niche and unique acts and displays, mostly, though not exclusively, of a naval theme. 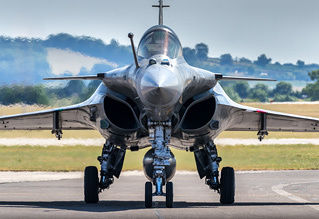 No truer example of that comes from the fact that, rare appearance at RIAT this year notwithstanding, the Yeovilton Air Day has for some years been the only place in the UK to see the highly-praised French Navy Rafale M displays. 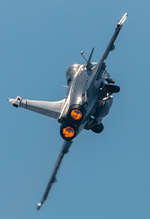 The Air Day continued to show its excellent links with the French Navy, with an even larger contingent of Aeronavale assets than last year. In 2018, the aforementioned ever-impressive (though, it must be said, slightly lacking the sparkle of last year's dazzling performance) Rafale M pairing were to be complimented in the flying display by a rare-as-hens-teeth ATL2. Alas, it was not to be, and for the second year running, the veteran Aeronavale MPA asset was dropped from the list. However, as a phoenix of sorts from the ashes of that cancellation, without skipping a beat, an even rarer display was confirmed as a replacement to the ATL2: a flying display from an Aeronautique Navale Falcon 50. The all-white biz-jet, regardless of its military markings, would never have been up to the sweaty and dirty charisma of the droning ATL2, but the spirit behind its confirmation was excellent. The huge effort to ensure that the British public were not to miss out on one of the French Navy's heavier items is to be praised. Building on the Rafale M pairing and the Dassault Falcon 50 displays, the Air Day secured participation of the excellent and rare Cocardes Marine formation, the continental equivalent of Britain's Navy Wings. Appearing with a MS760 Paris, its mainland UK debut, and the world's only Fouga CM175 Zéphyr, the carrier-borne variant of the Magister, the pair flew in formation with the aforementioned Rafales and Falcon before breaking off into their own display of elegance, telling part of the history of French Naval Aviation with it. This spirit from the French Navy did not stop there, though. As last year, a Lynx appeared for static display with one of the Aeronavale's brand new NH-90 Caimans in tow. The Lynx itself, the same machine that appeared last year, was this time adorned by simple but striking patchwork markings depicting Flotille 34F's colours. Speaking to the crew, these special colours of sorts were applied in the crew's spare time, just for its appearance at RNAS Yeovilton International Air Day, and by now are likely to have been removed. Such passion and enthusiasm to go to the effort of painting an aircraft exclusively for a public not their own is wonderfully endearing. It wasn't just the French Navy and associated Aeronavale historics that were hits in the flying and static displays, either. The meagre Lithuanian Air Force put in a sterling effort to the Air Day, with a C-27J, gorgeous Mi-8T, and L-39ZA mounts all on static. From an air force with very few of each of these machines, this was a rare and outstanding commitment from the militarily diminutive Air Arm. Other static gems included a welcome appearance by HeliOps' Sea King, XV666. Well-known as “Damian”, the former Culdrose-based 771 Naval Air Squadron Sea King marked a homecoming of sorts after years of service with the Royal Navy. A Dutch AS532, German P-3, a US Navy P-8, the now-familiar US Air Force Charleston-based C-17, and the Royal Canadian Air Force all significantly filled the sparse amounts of tarmac available to the organisers. The number of “heavies” on static felt unprecedented and were great to see, including the welcome, albeit otherwise unremarkable, debut of a Qatari Air Force C-130J. There seemed to be very little room left over for the cancelled Dutch KDC-10 Extender and NATO E-3A Sentry. It's fair to say that airshows aren't all about photographers. Of course they are not, though it's those photographs posted like wildfire on social media and forums that does a lot of free advertising and branding for next year's Air Day. But I can't help myself from wondering whether the positioning of those barriers was really necessary. Where space exists, would the non-photographing public really be at a loss if said barriers were positioned a little more widely? Only the most photographically-selfish would demand that no-one is allowed near to static machines, but at the same time, there has to be a happy medium. 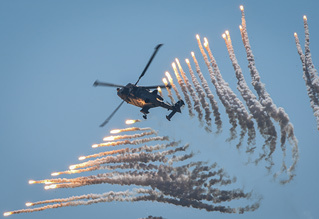 If barriers are at a shortage, then ropes and cones provide an alternative, airshows like Cosford and RIAT demonstrating for years that such a setup can be managed effectively. The day's other major photographic bugbear, though this one is beyond the control of the organisers, is Yeovilton's south-facing crowd. On a bright sunny day, harsh lighting and dark shadows made photography of an excellent flying display difficult. 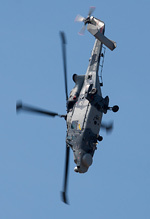 The display itself was opened by a formation, and subsequent final public display by a UK MoD in-service Sea King. The machines, which used to be everywhere in UK military colours, are now only to be seen in service as the ASaC7 variants. And a competent display it was, too, and a bittersweet moment, heralding an end to a significant chapter of military aviation in the UK. Whilst one piece of history set down, another was rolling in. The Sea Fury T20, absent from the UK scene since its crash-landing at Culdrose in 2014, repaired and in fine fettle re-introduced itself to Yeovilton crowds in formation with the Norwegian Historical Squadron's MiG-15, commemorating the Royal Navy's part in the Korean War, and indeed, the rare example of Sub-Lieutenant Brian Ellis' shoot down by a piston-engined aircraft of a jet powered one. 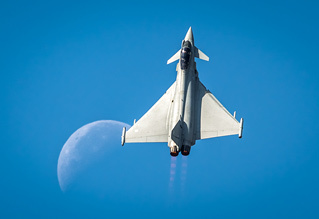 Further flying from the Royal Air Force Typhoon, Hellenic F-16, and Czech Air Force Gripen all contributed to what was, relatively speaking, a smorgasbord of fast jets. In addition, the Danish and Belgian F-16 displays returned once again, and, for the first time in many-a-year, a Royal Canadian Air Force CF-18 Hornet appeared at the show. The machine, wearing its NORAD 60th Anniversary colour scheme, appeared as part of its small tour of the UK this summer and allowed a contrast between European and North American fast jet displays. Its attendance at the Air Day should not be undersold, nor should the likely influence of the RAF100 celebrations in persuading the machine and its display pilot to visit the UK this summer. However, the fact remains that the Yeovilton Air Day was not part of official RAF100 celebrations, and whether by simple luck or hard work, credit must go to the RCAF and the Air Day itself for attracting the machine to enable two separate airshow crowds to appreciate the display that, in recent years, is very rarely seen outside of Canada. The true highlight of the day, however, was the return of the venerable Commando Assault finale. On a hiatus in 2017, the Air Day just wasn't the same without it. 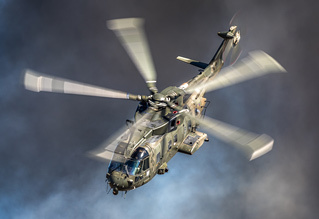 Taking place, as ever, at the end of the day, when the sun finally swings around into a favourable position, the pairs of Junglie Merlins, Army Air Corps Wildcats, and 736 NAS Hawk T1s provided once again a glimpse into the Royal Marines' bread-and-butter work. This type of stuff really hearkens back to the days of old. It's a statement. It's a base, with all its different personnel and equipment, working together and really showing what it actually does in its day-to-day role, and doing it in a captivating, inclusive, and unmissable way, something that the remaining RAF “at home” days lost sight of. It's often said that familiarity breeds contempt, that enthusiasts only like all the foreign rare stuff because we are bored of what's on offer at home. Maybe. But show them the Commando Assault demo, as the Air Day often does, and you'll have everyone back to watch the familiar old Merlins, Hawks, and Wildcats operationally strut their stuff time and again. There was no rare aircraft in the display. We've all seen Wildcats, we've all seen Merlins, we've all seen Hawks before, but the way the Commando Assault finale is shown, the story they tell, and the clear enthusiasm to tell it, is what makes the finale worth the ticket price alone, and though it was on a reduced scale, it was excellent to see it return. It felt like the Royal Navy had again managed to find its groove, after the Air Day was carried by foreign participation last year. This felt like a return to the Air Days of old, and, blessed by good weather, and a better football result, it was an event the organisers can be proud of.